My apologies for two blog posts in the same day, but I wanted to share this article by Matthew Tuininga on traditionalism and Reformed worship. It’s not at all unrelated to our discussions about the URC Psalter Hymnal. I intentionally present his post without comment–it’s simply another perspective for you to consider. Here is my synopsis of the content of Classis Southwest US’s overture on Hymn Changes in the provisional agenda for Synod 2012. 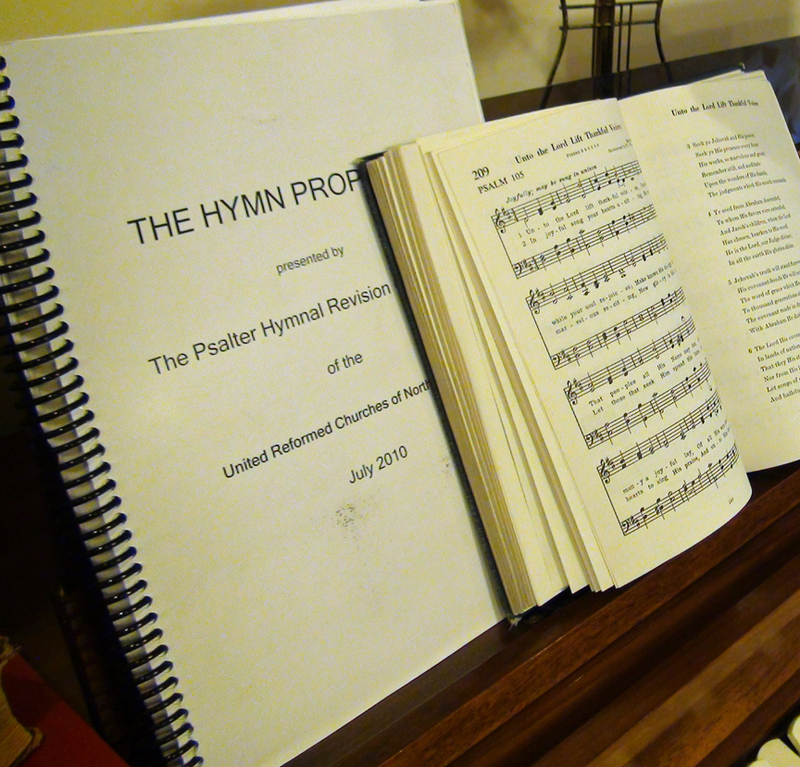 Summary: Classis Southwest United States overtures Synod 2012 to remove 11 hymns from the hymn section of the proposed URC Psalter Hymnal, remove individual stanzas from 2 more, add 4 songs, relocate 2 songs within the hymnal, and add an alternate tune for one hymn. Grounds: Just as in the previous overture, each recommendation is thoroughly documented with accompanying grounds. The overture appeals almost entirely to the synodically-approved Principles and Guidelines for Selecting Church Music. It interprets these rules strictly, including for deletion many popular hymns such as “For the Beauty of the Earth” and “God of Our Fathers” as well as some of the theologically lighter contemporary selections of the Hymn Proposal. Possible drawbacks: It seems that this overture lacks organization in several ways. First, I’m not aware of the reason for this overture (along with #4 and #6) coming before synod, rather than proceeding directly to the songbook committee as has been done in other classes. With regard to the overture itself, four recommendations for removal are duplicates of similar requests in Overture #4 (from the same classis), and two more items conflict with recommendations from this former overture (one requests individual verses to be removed, whereas the other requests entire hymns to be removed). The recommended additions pertain to unfamiliar songs that may be hard to evaluate on the floor of synod. One suggested addition has to do with the psalm section of the proposed Psalter Hymnal, which hasn’t yet been released for consideration. I fear that these structural flaws in Overture #5 will unnecessarily confuse the delegates and “gum up the works” of synod with tedious discussion. My thoughts: Undeniably, the recommendations of this overture are backed up with excellent grounds. If the URCNA had no previous musical background and was constructing the first hymnbook for its congregations, these suggestions would help ensure the excellence of the finished product. But does this overture take into account the decades of singing from the blue Psalter Hymnal in our churches? Familiarity, though always subordinate to Scriptural faithfulness, is a powerful factor. As is evident from Overtures #8 and #9, many churches are concerned about the Songbook Committee’s deviation from the contents of the traditional Psalter Hymnal. So where should we yield for the sake of unity, and where should we stand firm for the sake of textual and musical excellence? That’s the difficult question Synod 2012 will have to answer. See pp. 51-55 of the Provisional Agenda for the entirety of this overture. Below is my synopsis of the content of Classis Southwest US’s overture on Hymn Selection in the provisional agenda for Synod 2012. Summary: Classis Southwest United States overtures Synod 2012 to remove about 70 hymns from the hymn section of the proposed URC Psalter Hymnal. My questions: The majority of these removals seem reasonable and well-grounded. But do psalm paraphrases really detract from psalm singing, or do paraphrases help “bridge the gap” between the familiar hymns and the not-so-familiar psalms? Good, literal psalm settings are extremely important in a Psalter Hymnal, but could there be a place for paraphrases as well? (Where these paraphrases should be placed within the hymnbook—in the hymn section or in the psalm section—is another matter altogether.) Also, the rationale that non-Christocentric hymns should be removed excludes quite a few beloved and Biblically sound selections (such as “All Creatures of Our God and King” and “Praise to the Lord, the Almighty”). Should the fact that these songs repeat themes found in the psalms really prevent them from being included in the new songbook? See pp. 47-49 of the Provisional Agenda for the entirety of this overture. It seems nearly unbelievable that there are only thirteen quick days before delegates from the URCNA gather for Synod 2012. Along with this fast-approaching date, I’d like to introduce some “special programming” here on URC Psalmody. Over the next two weeks I plan to summarize each of the musically significant items on the agenda. Last week I referenced Glenda Mathes’s overview of the provisional agenda, which is the best resource for a complete introduction to the matters coming before synod. However, here it might be beneficial for us to look a little more closely at the musical implications of the agenda. I should also offer a note about the status of URC Psalmody during the week of synod: I probably won’t be sharing the specifics of synod’s deliberations as they occur. While synodical proceedings are open to the public (except for executive session), the immediacy of online media such as this blog lends itself to the potential for unnecessary controversy. Discussions on the assembly’s decisions can easily wait until after the meeting is over; “a word in season, how good it is!” (Prov. 15:23 ESV). Nevertheless, I plan to spend the week of synod discussing equally relevant topics, and I’ll try to keep URC Psalmody up-to-date with links to press releases and other news sources if possible. So stay tuned—this special feature will continue in a moment! Memorial Day—it’s a time of flags, food, and festivities that conveniently marks an early start to summer, but the “official” reason Americans celebrate this holiday is to honor the multitudes of men and women who gave everything they had to defend us from our enemies. That’s a legacy worthy to be celebrated. Psalm 114, a song of praise, commemoration, and thanksgiving, poetically proclaims the works of God on behalf of his people the Israelites. On one hand is set the almighty power of the LORD (v. 7), yet on the other is his watchful care over Israel (v. 8). Why should the sovereign Creator of the earth turn his sights on an insignificant Middle Eastern tribe? In Deuteronomy 10:14, 15, Moses explains to the Israelites, “Behold, to the LORD your God belong heaven and the heaven of heavens, the earth with all that is in it. Yet the LORD set his heart in love on your fathers and chose their offspring after them, you above all peoples, as you are this day.” What a legacy to remember! Psalm 114 isn’t shortchanged in the Psalter Hymnal. For the most part, the single setting of this song is Scripturally accurate and very serviceable. One possible drawback to the text is that it tends to simplify the poetic language of the psalm—for instance, “The mountains skipped like rams, the hills like lambs” in v. 3 is altered to “The lofty mountains and the hills/With trembling awe our God discerned.” Also, as is common with 1912 Psalter versifications, specific references to Israel and Judah are usually replaced with more general terms like “his people.” Whether or not these characteristics of number 225 are significant enough to merit revision—that’s for you to consider. The tune, VON HIMMEL HOCH, is one of the older selections in our Psalter Hymnal. Though our hymnbook credits the source to the Geistliche Lieder of 1539, this tune is actually attributed to Martin Luther. (Interestingly, it’s easy to hear vestiges of “A Mighty Fortress” in the last two lines of VON HIMMEL HOCH.) I’m not sure I agree with the editorial decision to place fermatas at the end of every line (wouldn’t it be better at the half-way mark only? ), but otherwise, it’s hard to find fault with a solid tune like this. Although it may seem unhelpfully vague, the comment that VON HIMMEL HOCH should be played “in moderate time” is actually a useful reminder; with chorales, it is surprisingly easy to play either too fast or too slow. I know this firsthand, since I’ve done it myself many times during congregational singing. For instrumental and choral purposes, on the other hand, the Psalter Hymnal Handbook suggests using one of J. S. Bach’s intricate harmonizations from his Christmas Oratorio. It’s wise for a nation to commemorate the heroic acts of selfless soldiers in protecting its citizens. But as members of a greater heavenly kingdom, we have an even more significant obligation. This Memorial Day, let’s give some thought to the message of Psalm 114. And let’s not fail to remember the mighty deeds of God our Savior, “who turns the rock into a pool of water, the flint into a spring of water.” Praise his Name!